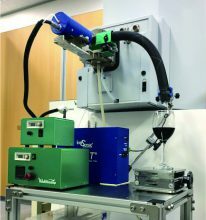 The Volatimeship is an optional device that effectively introduces the volatilized compounds to the DART ion source. The volatile compounds from the sample are introduced into the mass spectrometer as they are without separation or concentration, and the release behavior of the volatile compounds can be measured. 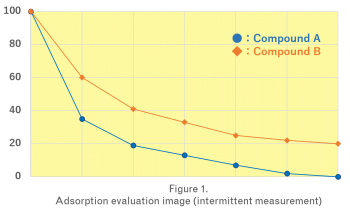 The adsorption rate is evaluated by intermittent measurement at regular time intervals using GC/MS etc. (Fig.1). Here’s an example of real-time monitoring of adsorption process using blue cheese as a source of odor and deodorant paper as adsorbent. It was confirmed that each compound attenuated by placing the deodorant paper. The attenuation level varies depending on each compound, and it was speculated this may result from the selectivity of activated carbon. In this way, it is possible to monitor the behavior of volatilized compounds in real time by using the direct mass spectrometry of volatile compounds.